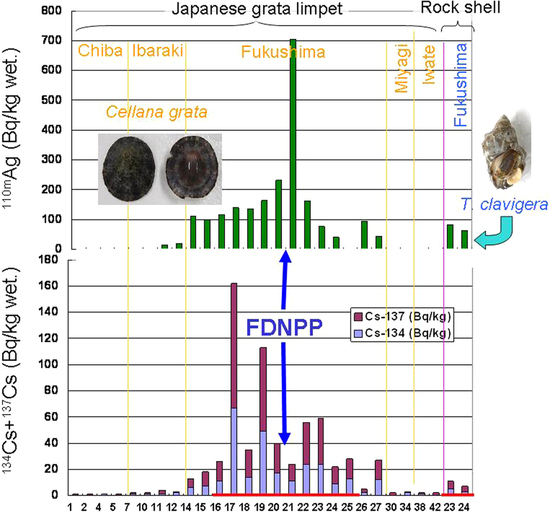 The changes noted by Horiguchi and colleagues in the intertidal community contrast with the lack of significant changes in benthic organisms along the Japanese coast by Sohtome and colleagues that was summarized here. The dotted circle shows the area within 20 km of the FDNPP (purple star). Red vertical bars on graphs and red dots on map indicate sites located within the 20-km radius of FDNPP. Note the absence of the rock shell sea snail within the 20 km radius of the plant and to 30 km to the south of FDNPP. Taken together with the 2013 monitoring data and the pre-disaster data it is clear there were declines in the numbers of species and density of intertidal organisms close to the FDNPP site after the disaster. What Role Might Have Radionuclide Contamination Played? These results show that in 2012 organisms near and to the south of the FDNPP had the highest tissue content of radioactive contaminants as indicated by radiosilver and radiocesium activities. The potential negative impacts of ionizing radiation on these intertidal species will scale with the dose experienced by these organisms. In the first weeks following the meltdowns measured seawater concentrations of 131-Iodine (131I half life ~8 days) and 137Cs were on the order of 105 Bq L-1 while 90-Strontium (90Sr half life ~29 years) was about 10-100 times less. These seawater levels are about 10 to 100 million times higher than levels in seawater now being detected off the coast of North American from the disaster. Estimates of the dose experienced by marine organisms in 2011 range from those that could cause reproductive effects and even mortality in highly sensitive organisms to doses much less than these threshold levels. According to the authors, with available information it is not possible to unequivocally attribute changes in community structure and abundance to radionuclide contamination. For example, other harmful substances released during the accident (most notably boric acid and hydrazine used during the emergency) could have induced toxicity in the local intertidal communities. The authors suggest the impact of ionizing radiation on community structure could be to allow competitive advantage between radio-tolerant and radio-sensitive organisms when the dose experienced in a location is high such as immediately after the disaster in 2011. When doses are lower ecological factors and variability might be more important than radiation effects. 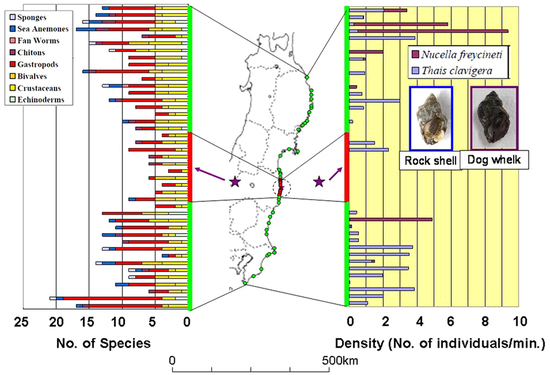 Further studies are required in order to determine the main cause(s) for declining intertidal biota near the FDNPP after the disaster. Such studies might include the determination of acute and sub-acute toxicity response to radionuclides, other contaminants and physical factors in the laboratory. Continued monitoring of the communities in time and space will be important to determine the time for full community recovery in the wake of the earthquake-tsunami-FDNPP triple disaster. 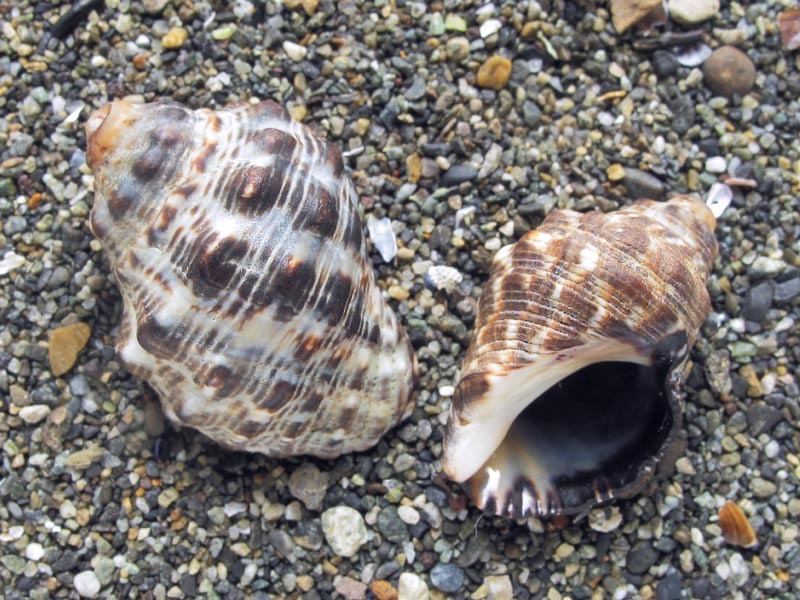 The authors stress that longer term studies will be important to determine how the low levels of ionizing radiation now present in the intertidal and other environmental insults post-disaster might have multi-generational effects on these marine communities going forward. Since the Japanese are no longer fishing bottom fish in that area, I can’t help wondering, what do those uncaught fish eat?